Illustrated lectionary readings at Vanderbilt Divinity Library: Year A - Year B - Year C.
Commentary and Spiritual Perspectives, Solemnity of Mary, the Holy Mother of God. Commentary, historical background, poems and readings. Center for Liturgy, St Louis University. Español. Preaching This Week commentary, Name of Jesus, WorkingPreacher.org, Luther Seminary, 2012. Comments (commentary) and Clippings (technical notes for in-depth study), the Naming of Jesus, Chris Haslam, Anglican Diocese of Montreal. The Name of Jesus, January 1, 2008, Joy L. McDonald Coltvet, Currents in Theology and Mission. "What's In A Name?" Anna Tew, Modern Metanoia, 2017. Sermon Brainwave: Name of Jesus, Lectionary podcast featuring Profs. Rolf Jacobson, Karoline Lewis, David Lose and Matt Skinner, discussing the week's passages in light of current events. At Luther Seminary's WorkingPreacher.org. 2012. Tuesday Lectionary Leanings, On the 8th day of Christmas, RevGalBlogPals lectionary discussion, 2012. 11th Hour Preacher Party. "The Feast of the Holy Name," Rick Morley, 2012. "Family Matters," Sharron R. Blezard, Stewardship of Life, ELCA, 2012. "To Ponder in Our Hearts," Brian Volck, The Ekklesia Project, 2012. "The Eternal Now in His Loving Arms," Suzanne Guthrie, Soulwork toward Sunday: At the Edge of the Enclosure, 2012. Daily Reflection, Mary, the Holy Mother of God, 2012, Larry Gillick, S.J., Creighton University. Reflexiones Dominicales en español. "Mary at Christmas Time," Andrew M Greeley, 2006. "The Name of Jesus on our Lips," the Rev. Charles Hoffacker, Sermons that Work, Episcopal Digital Network, 2014. El Santo Nombre de Jesús (A,B,C) – 2014, EL RVDO. RAMÓN AYMERICH, Sermones que Iluminan. "An Invitation to Intimacy with God," the Rev. James Liggett, Sermons that Work, Episcopal Digital Network, 2013. LCA Worship Planning Page, 2012, "Everything lay-readers need to prepare worship"
Lectionary Liturgies, Holy Name of Jesus, Thom M. Shuman, Presbyterian Church (U.S.A.), 2017. The Naming and Circumcision of Jesus, from Exciting Holiness, Collects & Readings for the Festivals & Lesser Festivals of the Calendar of the Church of England. "Solemnity of Mary, Mother of God," The Practice of Jesus, Bill Fletcher, Aotearoa-New Zealand, 2010. Laughing Bird Liturgical Resources, Holy Name, by Nathan Nettleton, South Yarra Community Baptist Church, Melbourne, Australia. Prayers, blessings, Eucharistic prefaces and scripture paraphrases. Prayers of the People, Holy Name. General intercessions for Sundays and Feasts, by Ormonde Plater, Archdeacon of the [Anglican/Episcopal] Diocese of Louisiana. 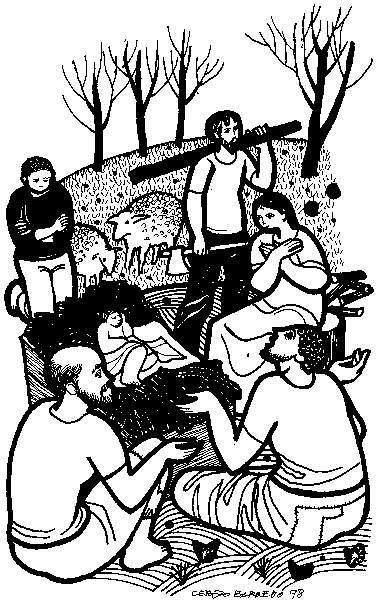 Introductions to lectionary readings for readers, the Naming of Jesus. Chris Haslam, Diocese of Montreal. "Liturgy: Prayer Reflection," reflections on the collect at the Eucharist, Rev. Bosco Peters, New Zealand. Thematic, Intercessory and Scripture Prayers for the RCL: Year A Year B, Year C, Vanderbilt Divinity Library. Prayers of the People, Feast of the Holy Name, Lowell Grisham, St. Paul's Episcopal Church, Fayetteville, Arkansas, 2012. Call to Worship, January 1, 2012, Mary Jane Konings, Timaru, New Zealand. Prayers and Musical Ideas,. Commentary, historical background, poems and readings. Center for Liturgy, St Louis University. Español. Sunday Prayer, Christmas 1/Holy Name/New Years Day, RevGalBlogPals, 2012. Prayers of the People, and Blessing, Lowell Grisham, St. Paul's Episcopal Church, Fayetteville, Arkansas, 2016. HermanoLeón Clipart, Mary, Mother of God. Holy Family, Free clipart, backgrounds, slides, etc. Clip Art, Mary, Mother of God, Fr. Richard Lonsdale, Resources for Catholic Educators. January 1 at Cerezo Barredo's weekly gospel illustration. Follows Latin American Roman Catholic gospel reading, though most gospels texts/themes are found in the index. Liberation emphasis. Images for this week's readings, Year B Pitts Theology Library Digital Image Archive. "Love and Service to Other, and Simplicity in Life Is What We Can Imitate in Mary," Solemnity of Mary, Mother of God. Flash presentation of this week's scripture texts. Hymn and Song Suggestions, Holy Name, 2013, annotated suggestions from Natalie Sims, Singing from the Lectionary. Hymnary.org: Holy Name of Jesus (Mary, Mother of God) Year A, Year B, Year C, hymns, scores, media, information. Shepherd Sounds, The Holy Name of Our Lord Jesus Christ. Background information for hymns and choral music following the lectionary from the Episcopal Church of the Good Shepherd, Austin, Texas, by Eric Mellenbruch and David Zersen. Lectionary Hymns, Mary, Mother of God, National Association of Pastoral Musicians. Hymns of the Spirit Three, Holy Name, Richard E. Hurst, Universalist National Memorial Church. Choral Anthem Project, Mary, the Mother of God, National Association of Pastoral Musicians. Prayers and Musical Ideas, Solemnity of Mary, the Holy Mother of God. Commentary, historical background, poems and readings. Center for Liturgy, St Louis University. Español. Lectionary Puzzles, Holy Name of Jesus. Word search puzzles in RTF or plain text, by Reg McMillan, St.Stephen's Presbyterian Church, Peterborough, Ontario.